PRIME Minister Peter O’Neill arrived in Israel on Sunday night to start his official state visit. He is visiting the Holy Land at the invitation of his Israeli counterpart, Benjamin Netanyahu. O’Neill landed in the capital of Israel to a warm red carpet welcome and anticipates returning to Papua New Guinea with pleasing results after holding high level bilateral discussions with Netanyahu. “During my bilateral talks with the Israeli Prime Minister, I will convey PNG’s interest in establishing a diplomatic mission here in Tel Aviv to further enhance and strengthen our existing bilateral relations and planned programmes,” O’Neill said. Other items to be discussed include using Israeli’s expertise in agriculture, defence, security and communications. 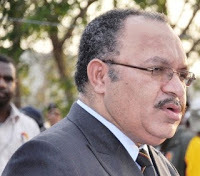 “My Government aims to draw on Israel’s expertise and experience in these capacities, predominantly in introducing compulsory national service to the young people of PNG,” O’Neill said. O’Neill is accompanied by ministers Rimbink Pato (Foreign Affairs), Tommy Tomscoll (Agriculture and Livestock) and Fabian Pok (Defence).